Designer Perry Dye & Dye Design Inc.
*I estimated as if I played from the black tees as I played in fact from the gold tees 400 yards shorter. 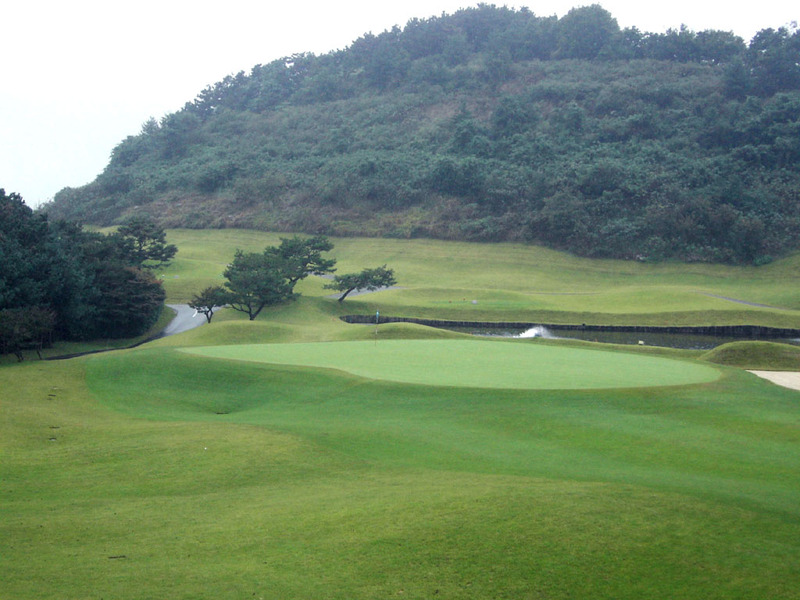 Woo Jeong Hills CC is a hillside course. 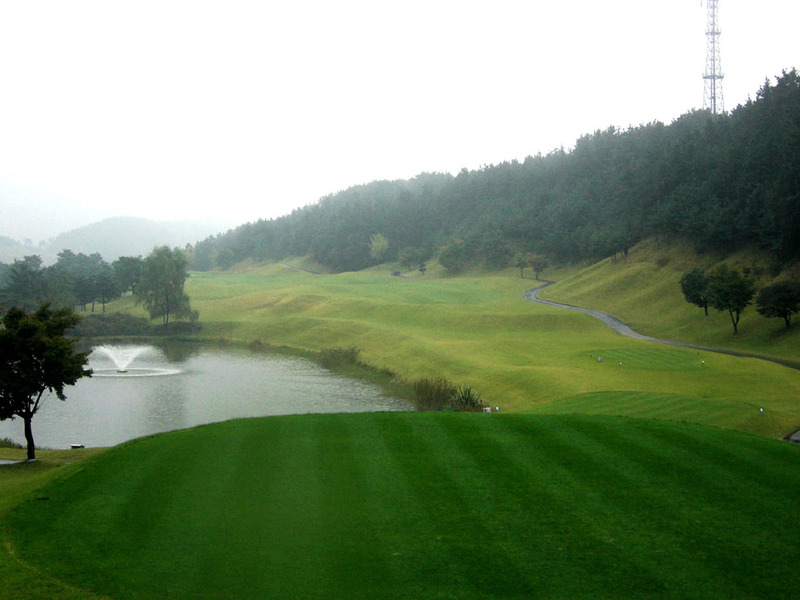 All par 3s are superb and demanding. 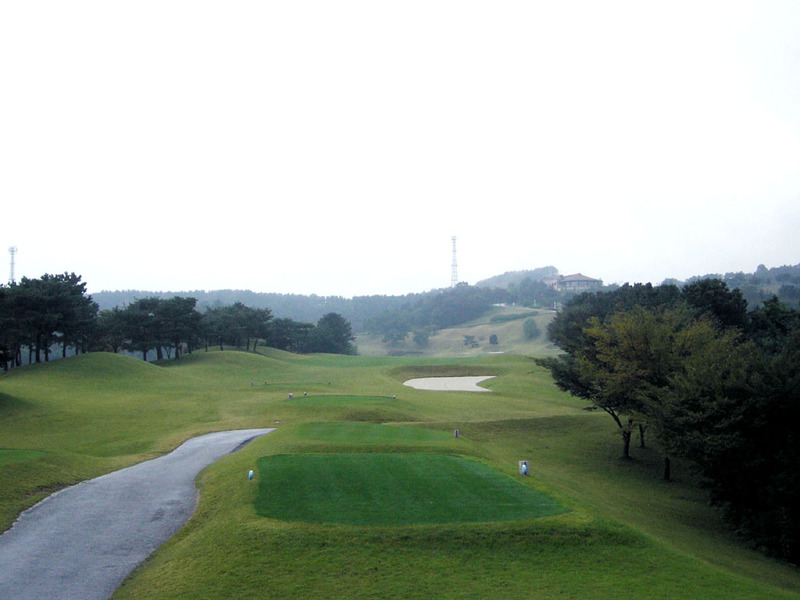 Undulating fairways, waters hazards and deep bunkers protect greens. 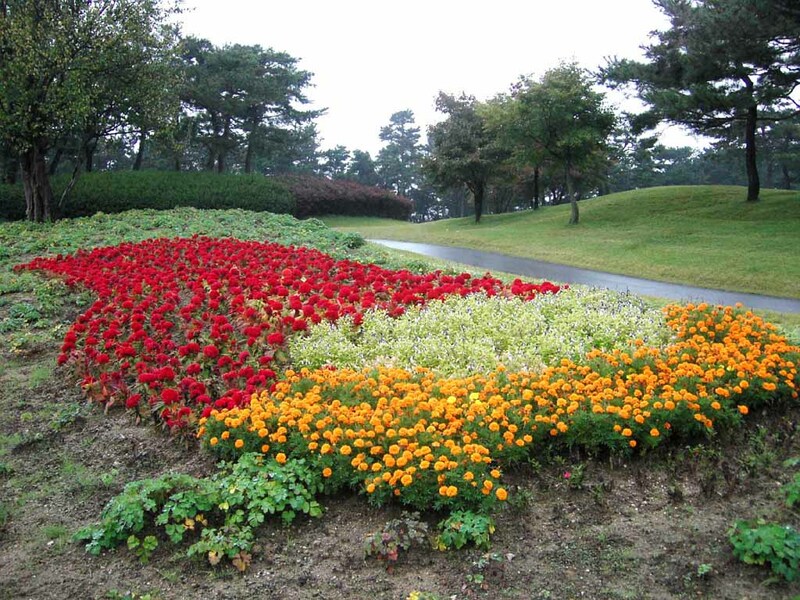 Add to that island green, all of which are peculiar to Dye’s design, are adapted here. 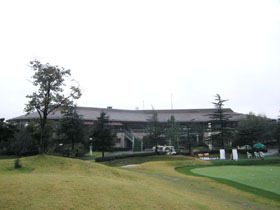 It hosted Korean Open in 2004. 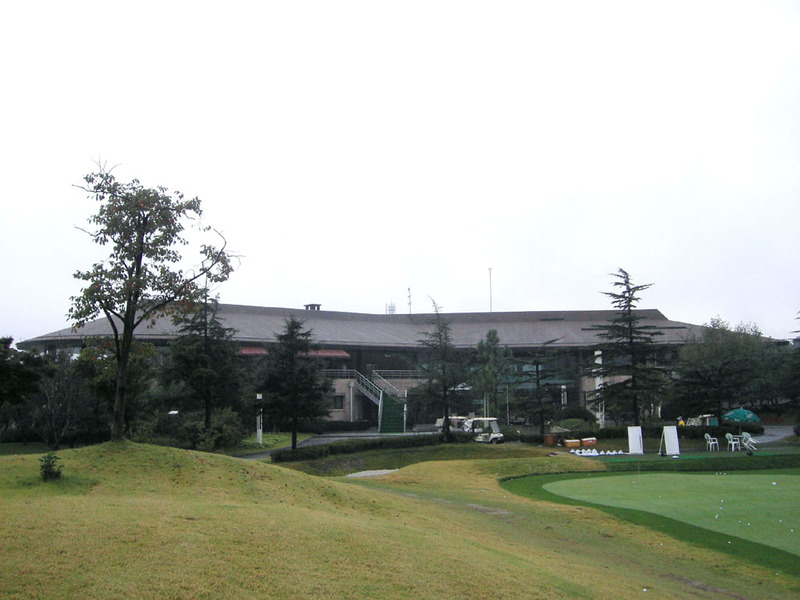 A grass clad, natural amphitheatre is made around the 18th green and its slope can accommodate many people without requiring the construction of spectator stands. An almost straight hole. The left side of the green faces water, so an accurate second shot is needed. 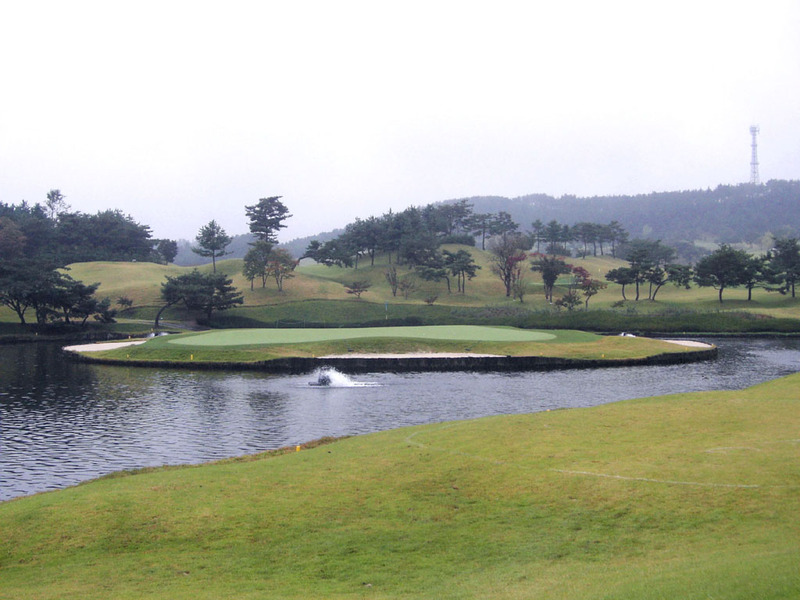 A relatively long par 3 over water. A bunker protecting the front of the green is very deep. A dogleg to the left. 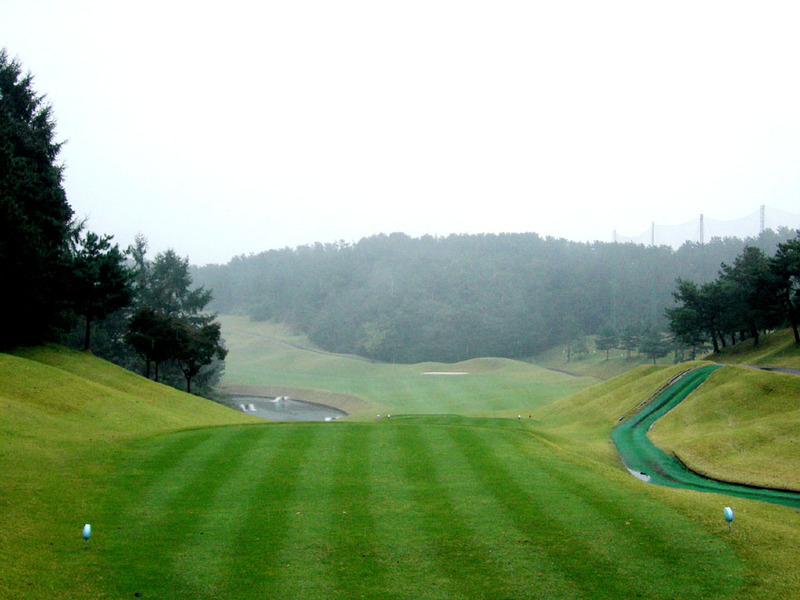 A downhill tee shot is followed by uphill second & third shots. 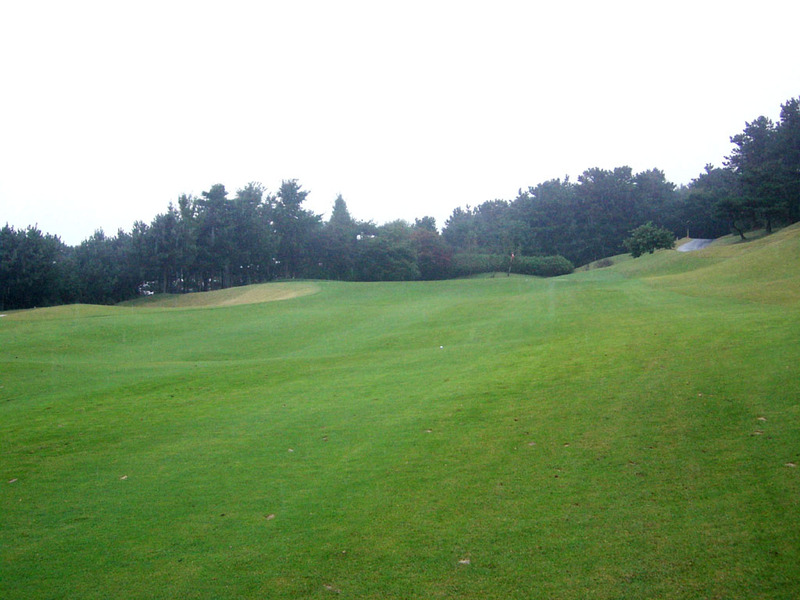 The fairway off the tee is narrow with water on the left and an OB on the right. 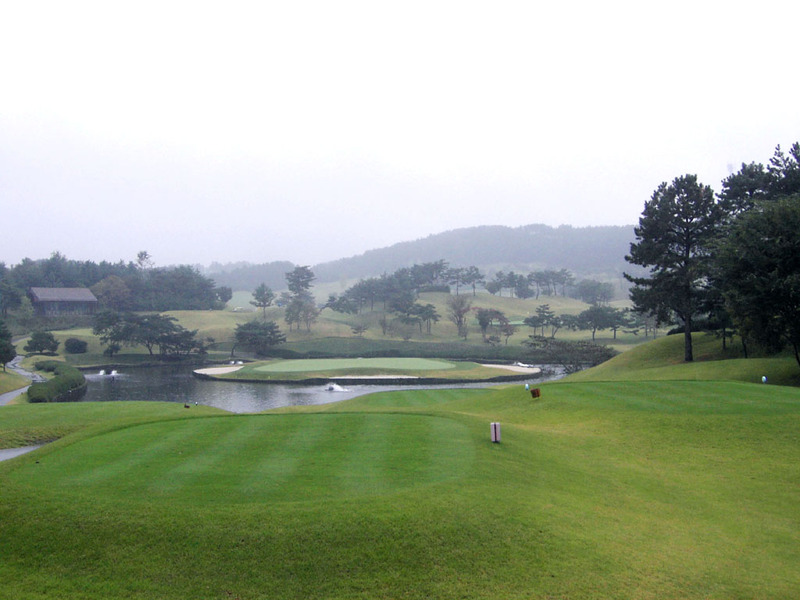 A slight dogleg to the left, gently uphill hole. 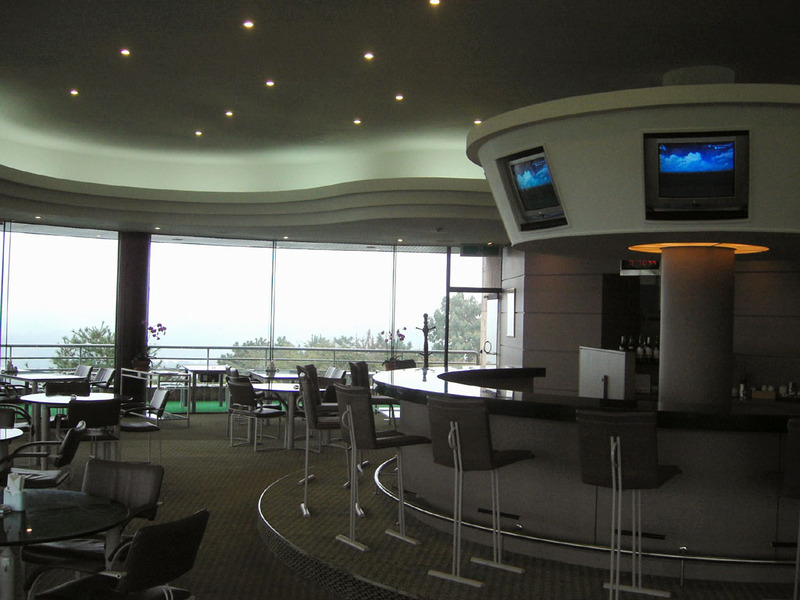 The green is elevated, requiring a high ball. 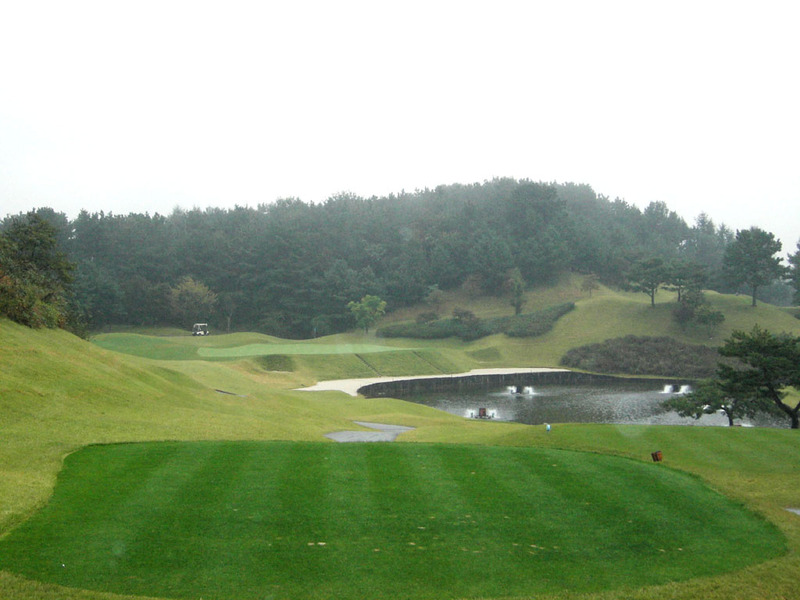 A bunker guarding the left side of the green should be avoided as it is about 7 meters (25 ft.) deep. A slight dogleg to the left. There are water on the left and thick rough on the right off the tee. The fairway is tight requiring an accurate tee shot. 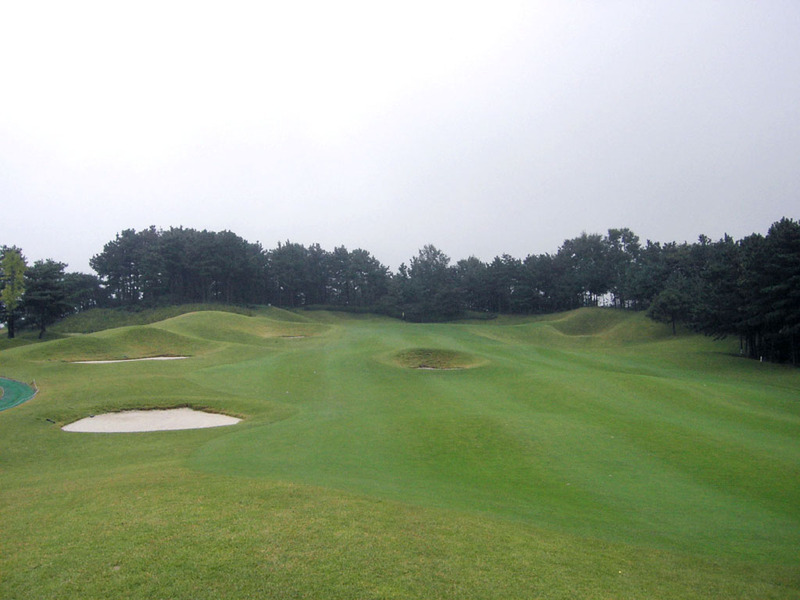 A bunker protecting the front left of the green is as deep as 5 meters. 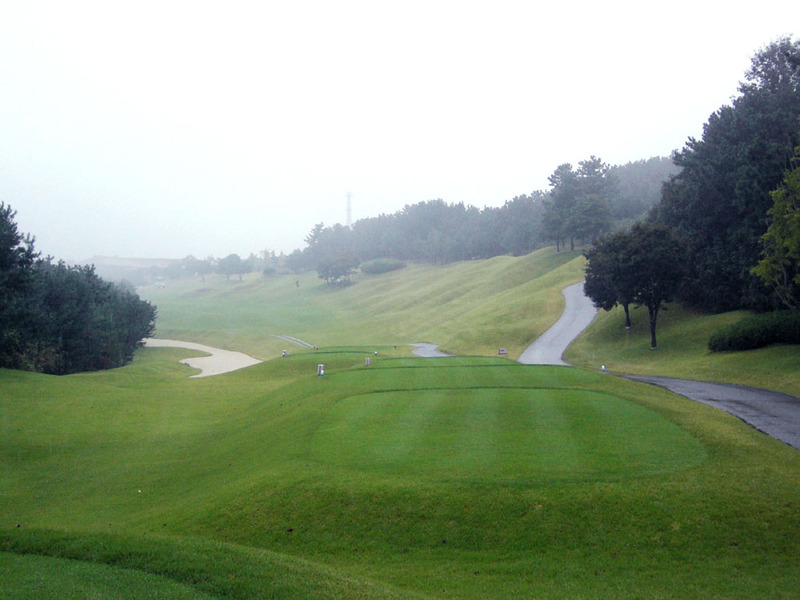 An uphill, short par 4. Various bunkers come into play off the tee, so the club selection not reaching the bunkers is important. 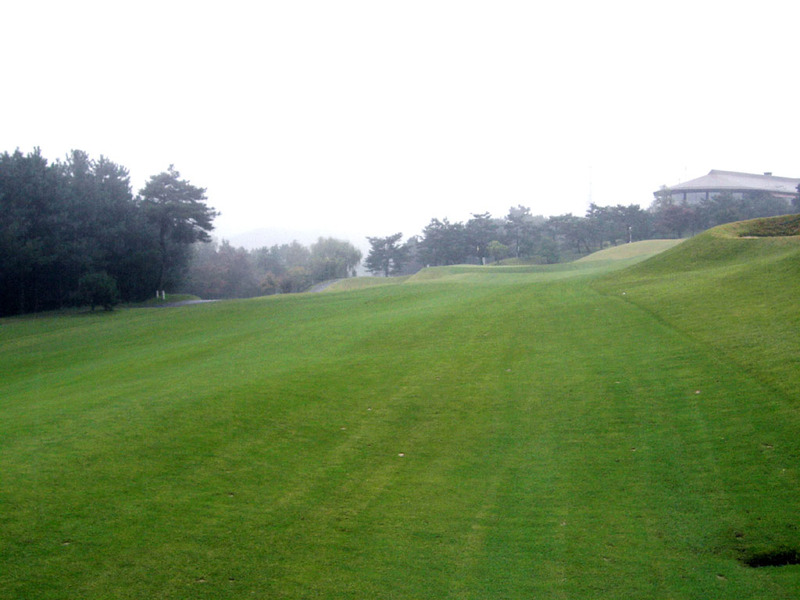 The second shot is steeply uphill. 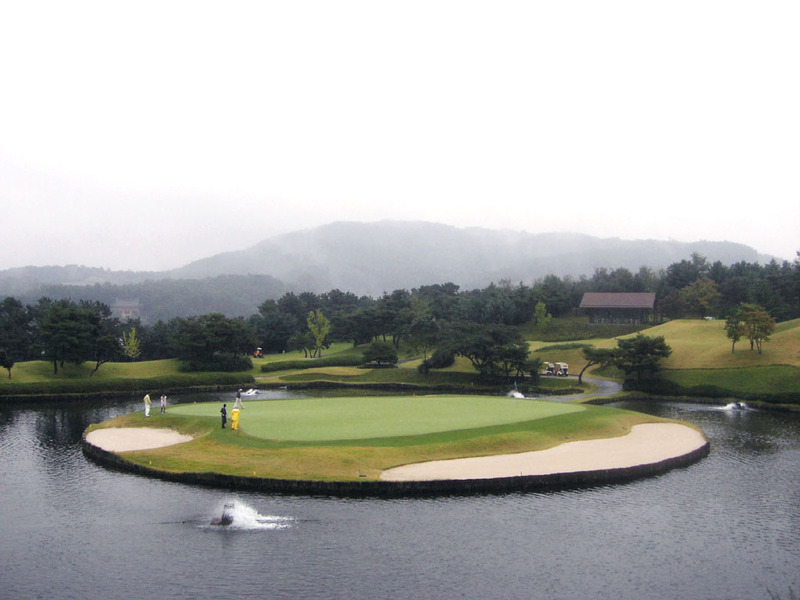 A par 3 with an island green. The tee shot is gently downhill. 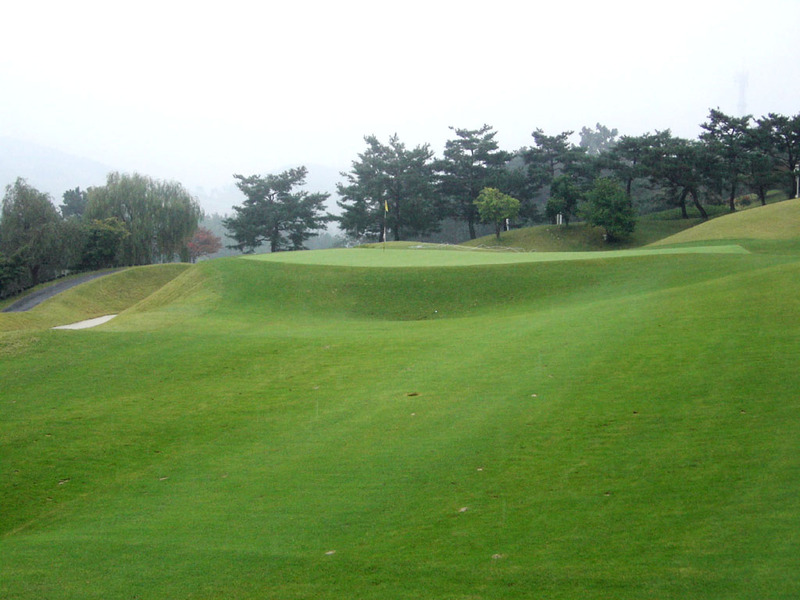 The green is high in the middle and slopes to the back. 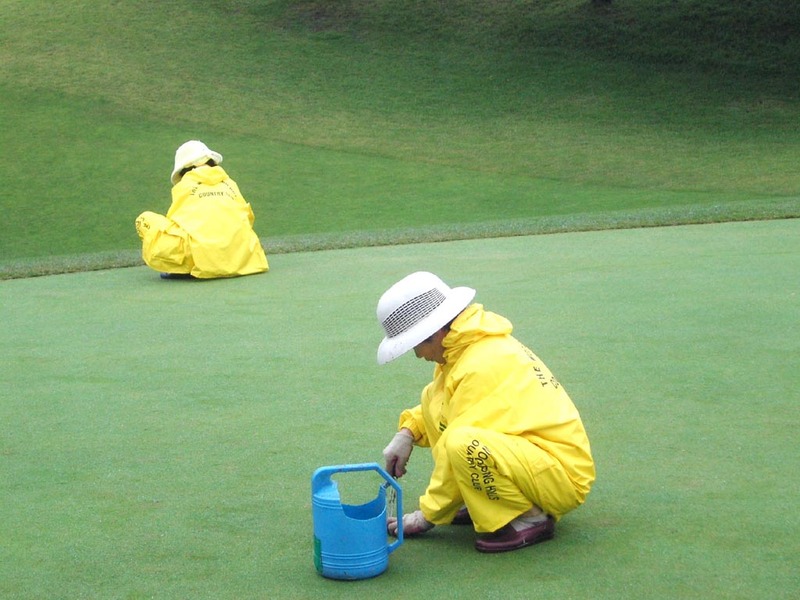 Personally speaking, I don’t like island greens as I feel they are too artificial. 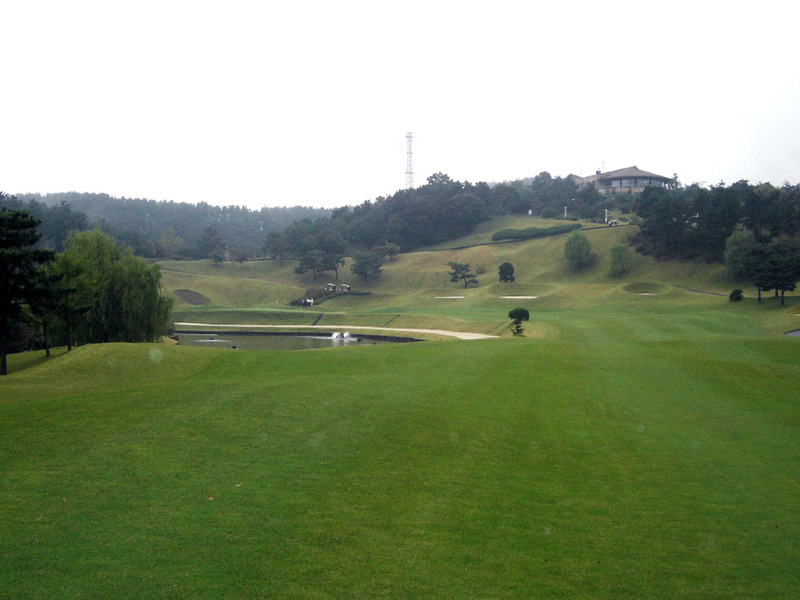 However this hole was an exception because it was challenging as well as very beautiful, so I enjoyed playing it. 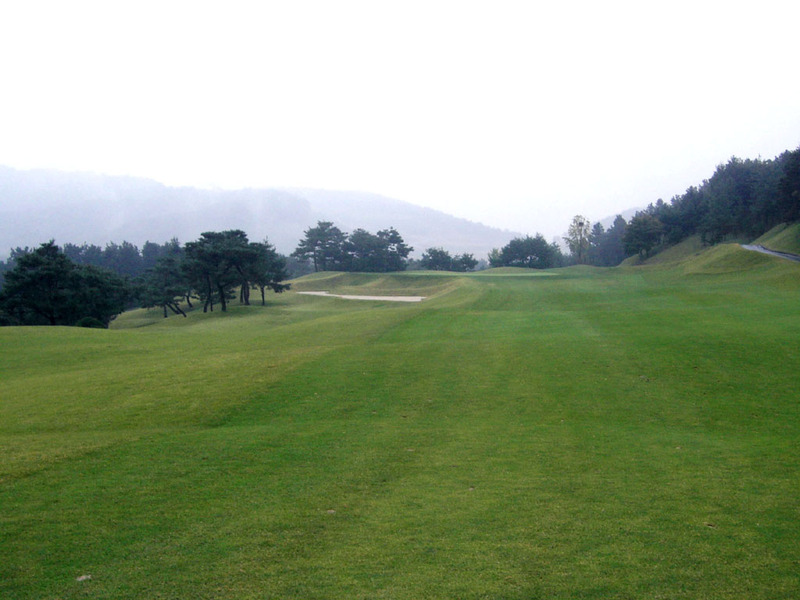 A demanding par 3. 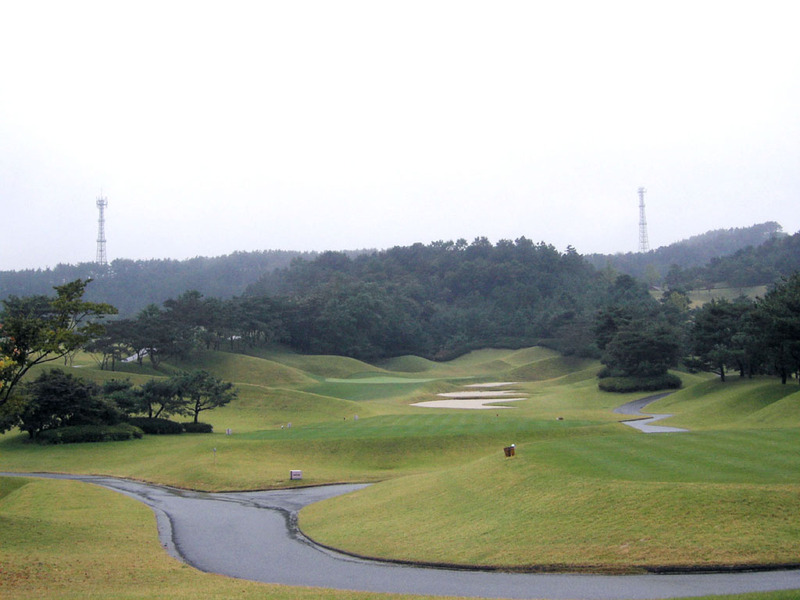 Deep bunkers on the right and mounds on the left make this long par 3 difficult. 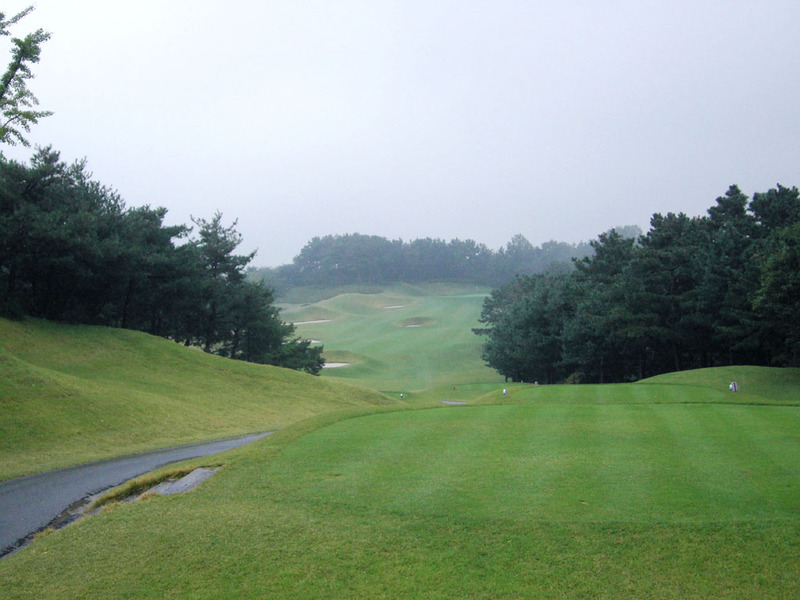 A Par 5 that starts straight first and then doglegs to the left 100 yards in front of the green. A bunker on the left comes into play off the tee. 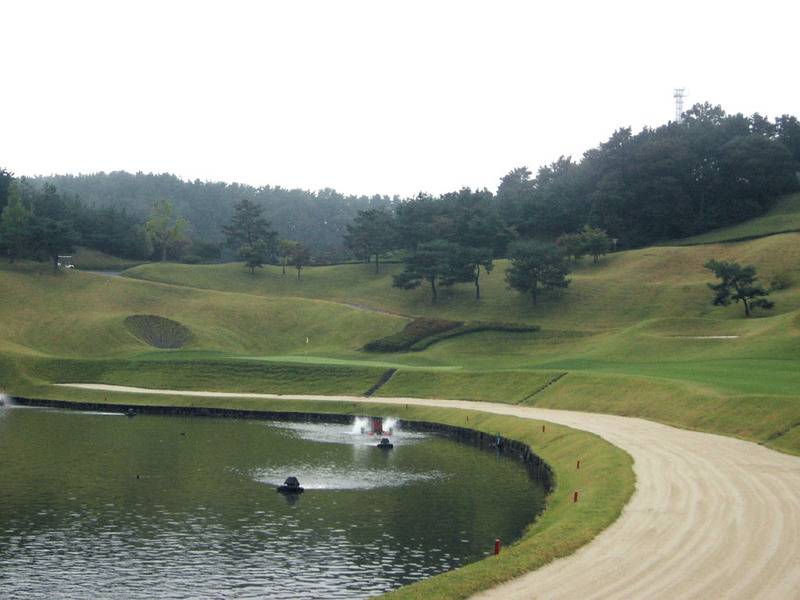 The landing area of the second shot is squeezed by water and a bunker on the left and slopes and bunkers on the right. A bunker protecting the front side of the green should be avoided on the approach shot as it is deep. 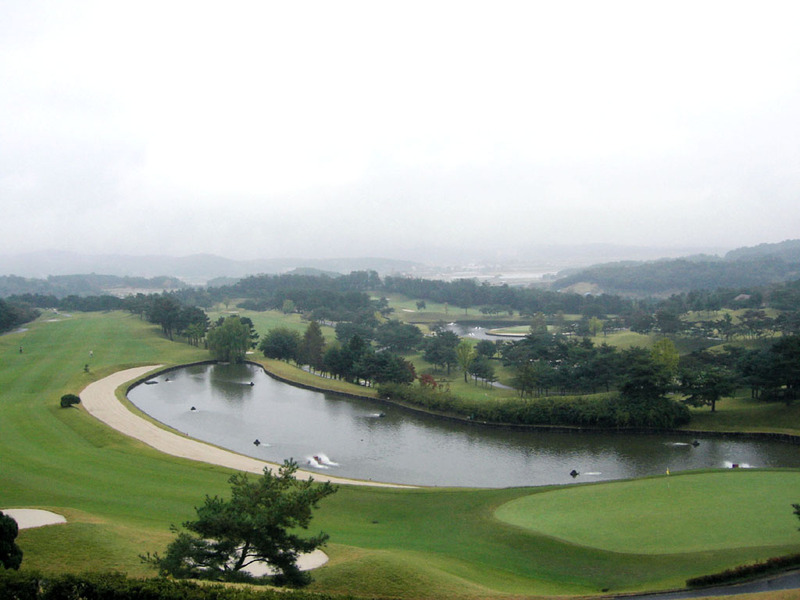 The course was chosen the 4th best course in Korea by US Golf Digest Magazine in 2003. 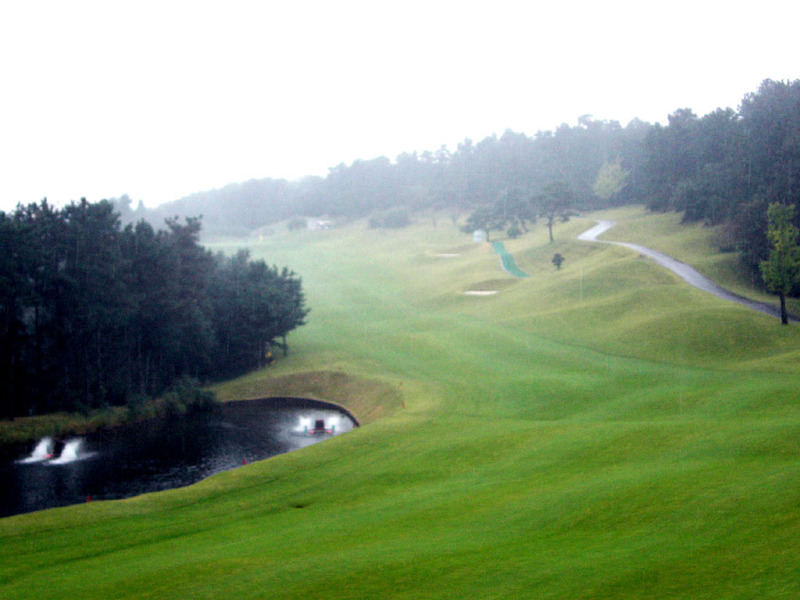 The other Pete & Perry Dye or Dye Design Inc. designed courses in Asia are Khao Kheow CC, Subhapruek CC, Thai Muang Beach G&M in Thailand, Laguna National G&CC in Singarpore, Castlex GC in Korea, and Orna G&CC, Poresia CC in Malaysia, Eagle Ridge G&CC - Andy Dye Course in the Philippines, West Coast GC in China, and St. 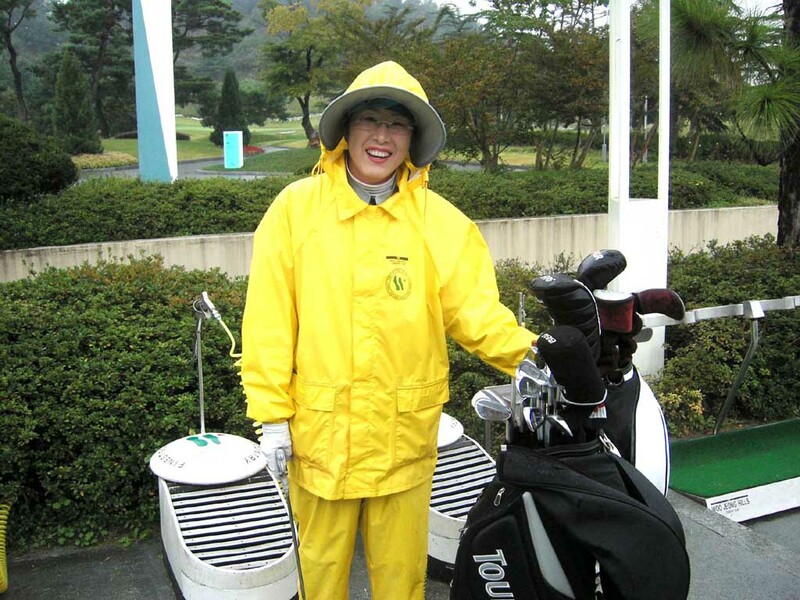 Lakes GC, Maple Point GC, Kaminami Springs CC, Golden Lakes CC, Kimisarazu GR, The CC Glenmore, Mission Hills CC, Iwase Royal GC in Japan.